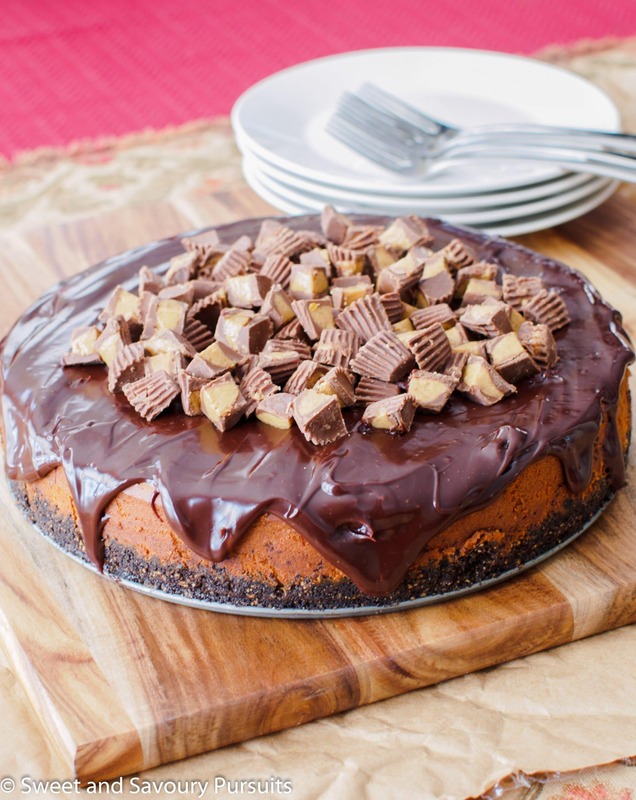 This Peanut Butter and Chocolate Cheesecake combines two favourite flavours to create one incredibly delicious cheesecake recipe. Cheesecakes are definitely one of my favourite desserts. I have tried many varieties and as of yet I don’t think I have a favourite, but this Peanut Butter and Chocolate Cheesecake is definitely a strong contender. The thing about cheesecakes is you don’t make them unless you have a large group of people you can share it with so it’s really a perfect dessert for a party! This Peanut Butter and Chocolate Cheesecake was scrumptious! Everyone enjoyed it and some even asked for seconds! I was also very pleased with the result, especially since I made the cheesecake part of this cake without a recipe to work from, this meant I had to keep tasting the batter to adjust the sweetness, but that’s not a problem for me since I love raw cake batter! And it doesn’t seem to matter what type of cake or sweet it is. I’m sure I’m not the only one out there who loves cake batter :). Right? 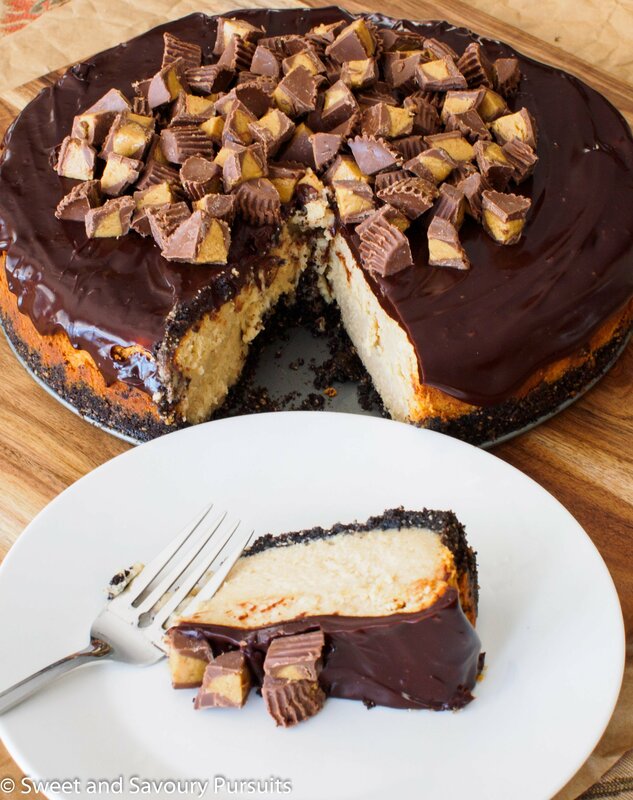 The cheesecake has a chocolate cookie and peanut crust, 3 packages of cream cheese, one full cup of peanut butter and a can of sweetened condensed milk, then its covered with chocolate ganache and topped with mini Reese’s peanut butter cups, needless to say it’s a very decadent cake! It was also definitely the heaviest weighing cheesecake I’ve ever made. If you love cheesecake don’t forget to take a look at my recipe for Mini Nutella Swirl Cheesecakes. 1 ml can sweetened condensed milk 300 . 6 ounces good quality chopped semi-sweet chocolate 170 g.
Place a rack in the center of the oven and preheat the oven to 325°F. In the bowl of a food processor, pulse 1/2 cup of peanuts until finely ground. Add the cookie crumbs, melted butter and sugar. Pulse just until ingredients are combined and mixture clumps together. Transfer crumbs into a 9-inch springform pan and using your fingers, press crumbs evenly onto the bottom and up (about 2 inches) on the sides of the pan. Bake the crust for 8 minutes. Remove from the oven and set on a rack to cool. Put the cream cheese in the bowl of a stand up mixer and beat (using the paddle attachment) on a medium high setting until the cream cheese is smooth and fluffy, about 3 minutes. Scrape down the bowl and beat for another minute. Add the sweetened condensed milk and beat for 1 more minute. Add the peanut butter and beat until the peanut butter is evenly incorporated into the batter, scraping down the bowl as necessary. Add the sugar, salt and vanilla. Beat until there are no lumps remaining in the batter. Add the eggs one at a time, beating until just incorporated. Do not over mix the batter once you have added the eggs or the cheesecake will puff and crack during baking. Pour the batter onto the cooled cookie crust and smooth the top of the cheesecake with a rubber spatula. Gently tap the cheesecake pan on the counter a couple of times so that the batter settles. On the bottom rack of your oven place a pan filled with boiled water. Take the cheesecake pan and place it on the centre rack of the oven and bake until the center hardly jiggles when the pan is nudged, 50 to 55 minutes. Set the cheesecake on a rack and let it cool completely. Cover and refrigerate the cheesecake for at least 6 hours (preferably overnight). Heat the cream, butter and sugar in a saucepan and bring to a boil. Pour the cream over the chopped chocolate and let the mixture stand for a few minutes before stirring until smooth. Wow…simply wow…. Awesome is a small word. Gorgeous it is. Wow! What am amazing looking cake. This is way too good to be true! This looks amazing, and I mean really amazing! Awesome job! Thank you very much! I was very pleased with the way this cake came out, both in the way it looked at tasted! Wow, does that look good or what?! I can’t take my eyes off it. It must have tasted incredible with the oreos and peanut butter. 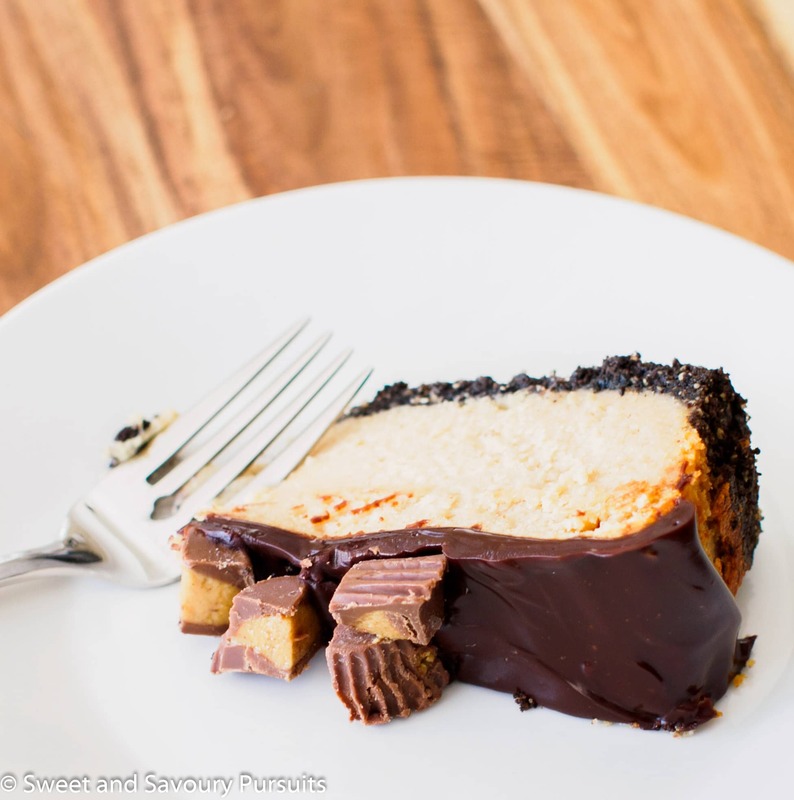 And the Reese’s PB cups garnish just takes it to another level! What a fabulous cheesecake! Thank you so much, yes it really was delicious. The peanut butter cups are extra yummy on this cake. Wow!!! This looks fabulous! Peanut butter heaven!! Thanks, I found that it made the cake seem even more decadent! This looks fabulous! Peanut butter and chocolate…what a great combo. Yum! Thanks! This is a perfect cake for a big crowd, a small piece goes a long way so this will serve lots of people. I’m looking forward to making a baklava cheesecake in the near future. WHOA….that cheesecake looks crazy delicious. Right up my taste bud alley with all that lovely peanut butter and chocolate. The cheesecake layer looks perfect, too! Thank you, it’s one of the best cheesecakes I’ve made for sure! Thanks for stopping by and leaving a comment. This cake looks so yummy! Love the peanut butter and chocolate. I will have to give it a try…. Thanks! I saved you a piece. My, oh my….this look heavenly! Love anything chocolate and peanut butter, but together in a cheesecake takes it to aother level for me! This looks absolutely delicious! Thank you so much Nancy! I know what you mean peanut butter and chocolate just go so well together. The temptation was too much… after seeing the post I ran out to the store and made it! WOW- delicious! I served at a dinner party last night, and even though it didn’t get the overnight refrigeration it was still fantastic 🙂 Thanks for sharing such a delicious recipe! Oh my goodness, that’s great. Thanks so much for letting me know! This would make an incredible centre piece if you were catering for a crowd. The mini peanut butter cups certainly give it a wow factor! Thank you, good to know I’m not alone with the cake batter thing, it’s just so yummy!